My cousin Peter Lazes was in Copenhagen on business. He was having dinner alone in a restaurant. Next to him were a man and his daughter. She got up to go to the restroom. While she was gone Peter and the man made small talk. Turned out the daughter is a woodworker, just done with four intense years of school and yearning for an internship in the U.S. My cousin suggested she might want to talk to me. He gave her my contact information. Last year Ane wrote to me. After we went back and forth for a bit, my colleague Deirdre worked with an organization called Experience International to get her a J-1 work visa (A J-1 is a non-immigrant visa issued by the U.S. to research scholars and visitors participating in cultural exchange programs, especially for medical or business training – for now, even in the Age of Fear, you can still get them). She started work in our shop in early October and just completed her six-month internship. At times it was not so clear who was the intern, her or us. 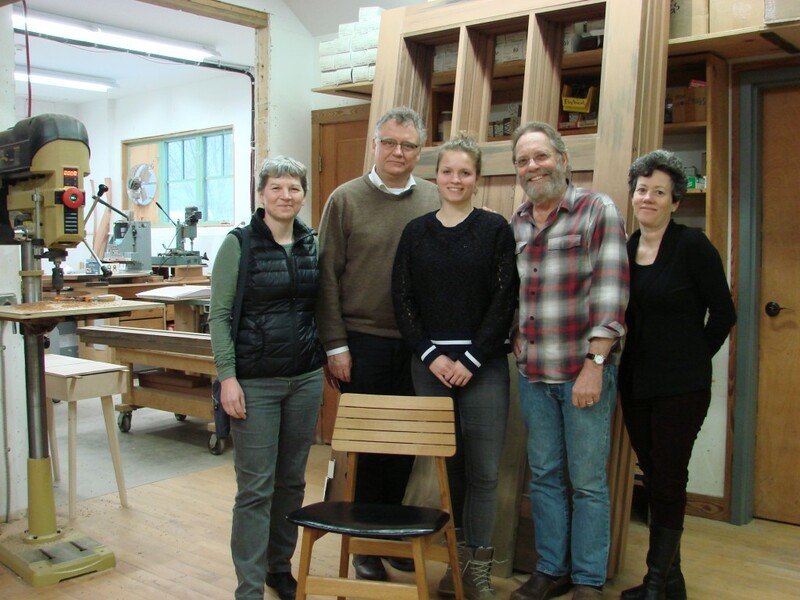 From day one it was clear she has remarkable skills – an accomplished woodworker with advanced abilities in design, cabinetmaking and furniture making. She immediately sees the totality of a project and plans accordingly. Her design sensibility is modern, Danish, and creative. When planning is complete, she moves swiftly, seamlessly, and competently through every project she tackles. It soon became apparent that we should take full advantage of the opportunity of her presence to do more with her than we anticipated. Our shop foreman, Jim Vercruysse, understood the breadth of her talents and decided we should begin a major chair design and building project. 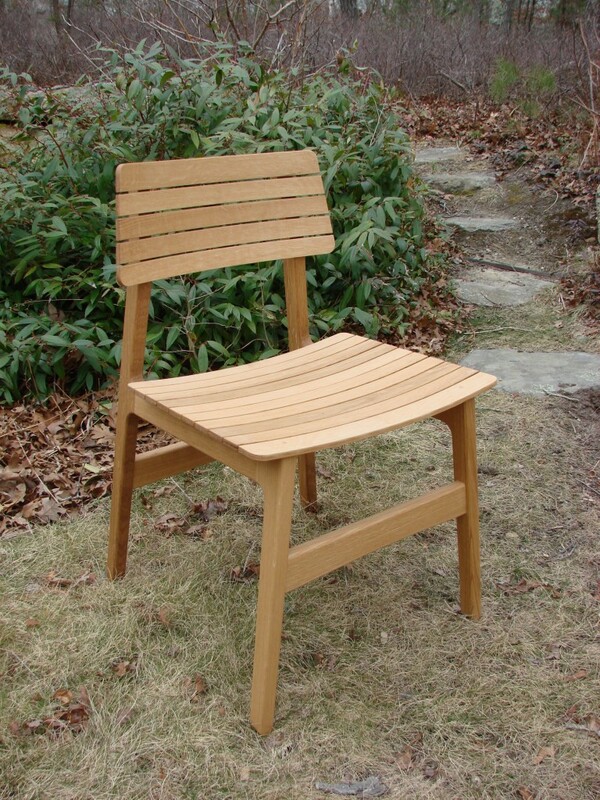 Ane worked with Jim and with Ryan, one of our architects, to design a set of chairs. Then she built them. They’re beautiful, ergonomic, and comfortable. Along with her place in the shop, she quickly became embedded in the culture of the company and was regularly involved in coffee break and lunch discussions. She formed strong relationships both within the company and in the Martha’s Vineyard community. Like many of her fellow Danes she is completely dumfounded about a country as remarkable as the U.S. being so completely screwed up. Makes no sense to her. Or to me, for that matter. Ane’s parents, Holger and Marianne, came to visit while she was here. Her father is an architect and her mother is a banker. If he could have, Holger would have spent his entire time hanging out with our architects talking shop. I took them for a tour of some of our houses. The level of craft blew him away; he said you don’t see work like this in Denmark. Funny thing, isn’t it, when his own daughter is such a superb craftsperson? He wrote to us recently and said “at my office we talk and think a lot about the way you run South Mountain.” That’s gratifying. He also said that when they picked her up at the airport they asked her if she missed everyone on the Vineyard and she burst into tears. We miss her too. If the opportunity arises, we will have her back in a heartbeat. If you’re reading this, Cousin Pete, thanks for choosing that restaurant in Copenhagen, thanks for sitting at that table, thanks for leaning over to chat, and thanks for planting the seed.